Tiny Prints is having a 25% OFF SITEWIDE sale this week to celebrate their birthday. From now through 03/05/2013, just use promo code BDAY13 during checkout to receive the discount. There is no minimum purchase required for this promotion. Offer expires 03/05/13 at 11:59 pm (PT). Future brides rejoice! From now through 02/26/2013, enjoy up to 15% off party invitation orders at Wedding Paper Divas. No coupon code is needed and there is no minimum purchase required. Offer expires 2/26/2013 at 11:59 pm (PT). Attention maids of honor, the time for bridal showers is fast approaching. So when should the shower take place and what do you need to get started? When: The shower can be thrown anytime from four to six months before to the week of the wedding. If the wedding expects a lot of out-of-town guests, the closer to the wedding the better so that they can attend. If not, the bride will probably appreciate having it two to four months before the wedding. This will not only heighten the anticipation but also give the bride one less thing to worry about in the weeks leading up to the big day. Generally speaking, it is best to wait until after the invitations have gone out to being inviting people to the shower. Traditionally bridal showers are held on Sunday afternoons but any time day or night works. What: The first thing you need is some great bridal shower invitations. I suggest Wedding Paper Divas. One of the great things about using them is that you can coordinate the shower invitations with the bride, so that they match the wedding invites and the rest of their color scheme and designs. They also have also have totally chic save the dates and all of the good stuff the couple needs for the big day. 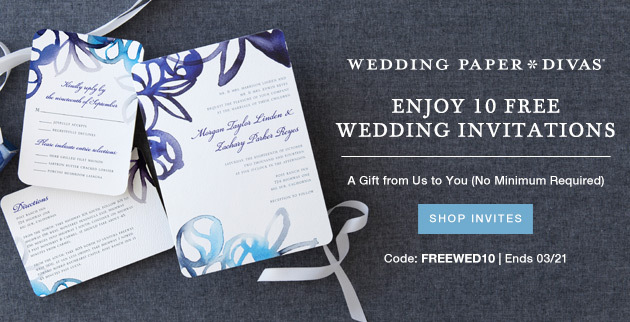 And to make it easier on your wallet as well, Wedding Paper Divas is offering the following promotion: Save $10 off orders of $75 or more, $25 off orders of $149 or more, or $50 off orders of $249 or more using the code TP50WED during checkout. Offer expires 03/05/13 at 11:59 pm (PT). Up to 20% off Wedding Paper Divas Invitations & Reception Stationery! From now till 02/19, save up to 20% off Wedding Paper Divas Invitations and Reception Stationery! Here's how: you get 15% off orders of $149 or more, or 20% off orders of $249 or more when you enter promo code:	20FEBWED during checkout. This offer expires 2/19/2013 at 11:59 pm (PT). Here's a little pre Valentine's day love for everyone! Tiny Prints is having a sitewide sale: enjoy 15% off any order you place now through 02/19/2013. Just use promo code 15FEBSW during checkout. There is no minimum purchase required for this promotion. Offer expires 2/19/13 at 11:59 pm (PT).